Scott proudly displaying a model way, way back in the day. We’ve all been there, right? You know; sitting at the field or on the bench looking at a model that you poured your blood, seat and tears into … after it’s been swept into a dust bin after a yard sale crash. Perhaps it was a mechanical failure. Perhaps it was an improperly setup radio. Perhaps it was just plain dumb thumbs. Perhaps it was all of the above, but that’s not really the point. What matters is that it happens to all of us at some point or another in our modeling and RC flying careers. We are all human (last I checked) and as such, we make mistakes. We are stubborn and sometimes ignorant. We are impulsive and impatient. We are also creative and adaptive though. We are all those things and the fact that we are human means we are going to make mistakes. Of Course, some of us take it to sadistic levels of stubbornness or wallet-bending trips to the LHS, but all of us have to get back up, dust ourselves off and get back into the air again. Why? As in, why the hell would I want to waste my time scratch building another beautiful model when my last one got destroyed? Why would I want to keep practicing that ever elusive 3D maneuver when I’ve already trashed two planes trying to perfect it? Why would I want to continue on with pylon racing when my old thumbs aren’t really keeping up with the millennials at the field? WHY??!! Well, you already know why, otherwise you wouldn’t be reading this. It’s the glory you bask in after a full day of successful flights. It’s the joy you feel after a self-designed, stick-built model flies like a dream. It’s the thrill you get when you hit that perfect first flat spin and you do it over and over again (much to the behest and jibes of the fellow club members). It’s being able to finally fly on your own after being trained by a competent veteran pilot. That’s why. For all the failures we suffer, whether self inflicted or not, the highs are much higher than the lows and Scott is ready and willing to share a few of his own tales that kept his focus strong in the aeromodeling hobby. I thank him for his humility and willingness to share his stories, even if they get him a few robust fists to the shoulder at the field this year. Thanks Scott! I was a pretty typical 12 year-old kid in the summer of 1984. I was in love with baseball, glad to be out of school and filled my days with playing and exploring. One thing that seemed to separate me from my contemporaries was my absolute passion for airplanes. My cousins, my brother and even my uncles had a surface interest in aviation, but for me, it was much deeper. When I relaxed, I had a model airplane magazine in my hands. When I went outside, it was rarely without something to fly. When I daydreamed, my thoughts drifted to the magic of biplanes, round engines droning overhead and mayflies dancing over sunlit grass landing strips. Like most 12 year-old dreamers, I was a boy with big dreams and small budgets. 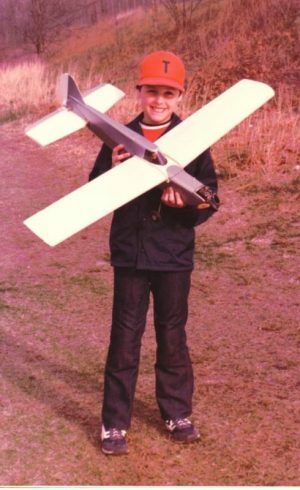 Until now, I had been content building rubber-powered free-flight models, but wanted to get into RC in the worst way. I had a paper route, but the cost of a kit, radio, engine, etc. was well beyond my financial grasp. 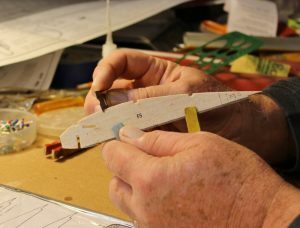 My grandfather was an RC modeler of some repute, mainly in the realm of “sport scale”. He has to be given most of the credit or blame for my interest in aviation. My Mom would smile and comment, “Child’s life ruined”, when he and I would return from the flying field, excitedly chattering about our aeronautical exploits. I loved attending contests with him throughout the late ‘70’s and early ‘80’s and he had also done a little bit of RC flight training with me using his old Fleet biplane and Kraft radio (with no buddy box; we hurriedly passed the transmitter back and forth during lessons). If my interest in RC wasn’t galvanized before that, it sure was afterward! He decided when I turned 12 that the time was right to give me the responsibility of my own RC airplane. When that big rectangular box showed up on my birthday, I was pretty sure I knew what it was! The box was labeled “Midwest Bonzo”, a 1/2A pylon racer, based loosely on Steve Wittman’s famous race plane. My grandfather thought that if we revamped it slightly and powered it with an O.S. .10 with 3 channels it would perform well. 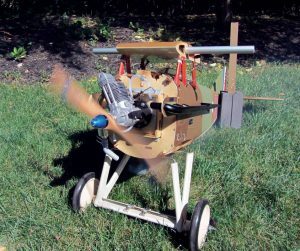 We spent about a month of free time building the airplane together and it looked great when we finished! The color scheme was white and silver and we even put a hand-painted pilot figure under the canopy. The ship was guided by an ancient O.S. 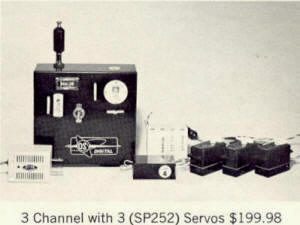 3-channel radio, which seemed to have an antenna so long it could cast trout flies! I patiently waited for the day we could fly. We got together on a brisk, sparkling morning to finally fly the Bonzo. We did our pre-flight check, filled the fuel tank and started and tuned the engine. I lifted it to shoulder height. 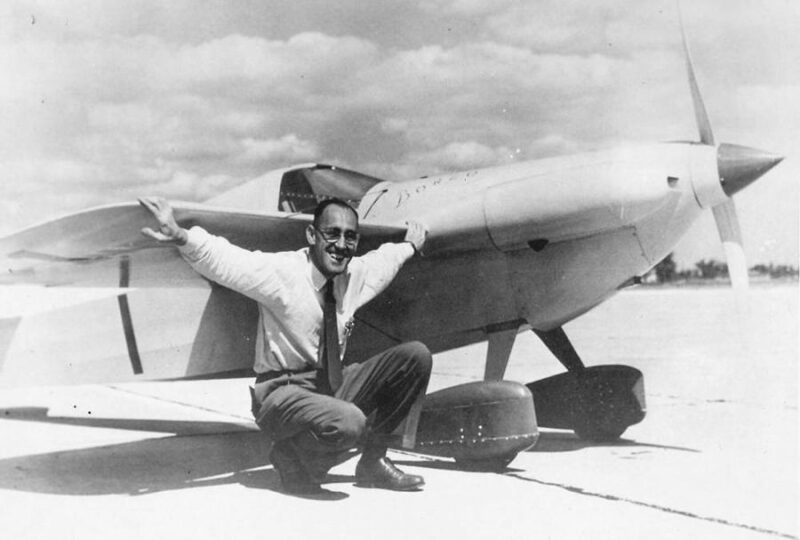 When I got the head nod from my grandfather, I ran about as fast as my legs could carry me and gave the Bonzo a hefty push when I felt the plane starting to lift from my hand. It was one of the best hand launches I had ever performed and the Bonzo climbed away magnificently! We put in a few flights that day, and I took the controls for at least half of the flight time. What a rush! After a couple such sessions, my grandfather felt I was sufficiently adept at handling the Bonzo, so he set me up with some field equipment and fuel and let me take the Bonzo home. This is when the learning really began! I was so excited at the prospect of my first true solo, I could hardly wait for the first good flying day. It was a hot, calm day in July with light winds and perfect clear skies. The Bonzo was loaded into my Mom’s car and off to the schoolyard we went. Like a typical 12 year old, I had more confidence than experience and thought to myself, “I’ve got this.” The objective truth of the matter was far different than my perception. An ad for the ultra hig-tech radio system from O.S. After starting the balky engine, I did all of the checks I was taught by my grandfather and felt I was ready to go. I throttled up and my pulse quickened. 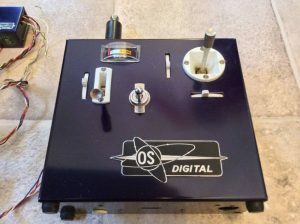 I started to run forward, but in the excitement of running, holding the transmitter in one hand and anticipating what I would do next, I rushed my launch and the Bonzo barreled into the ground. Broken prop, bent landing gear, bent pride. I replaced the prop, straightened the gear a bit and tried again. This time, the launch was good, but I failed to let the model gain sufficient speed before pulling back on the stick. You can guess the results; one massive stall, a brief moment of pilot terror, followed by a half-roll directly into the ground. This time the firewall was broken, the wing was broken near the root and I was dejected. I learned a lot from my time with the Bonzo and held onto the airframe until only a few years ago. It had some sentimental value and was a reminder of some of the less-intelligent, hurried decisions I had made in my modeling past. I would love to tell you all that I only found success after this learning experience, but… you’ll have to wait until next week to hear my next adventure in RC flight.